I won't lie. I ordered this movie from a nehaflix sale bin because I wanted to see my FPMFIL again. It's been awhile since Muqaddar Ka Sikandar and...I miss him. And I swear it has nothing to do with the insanely tight flared trousers. But every girl's crazy 'bout a sharp-dressed bad boy with a coconut-shell grenade, na? 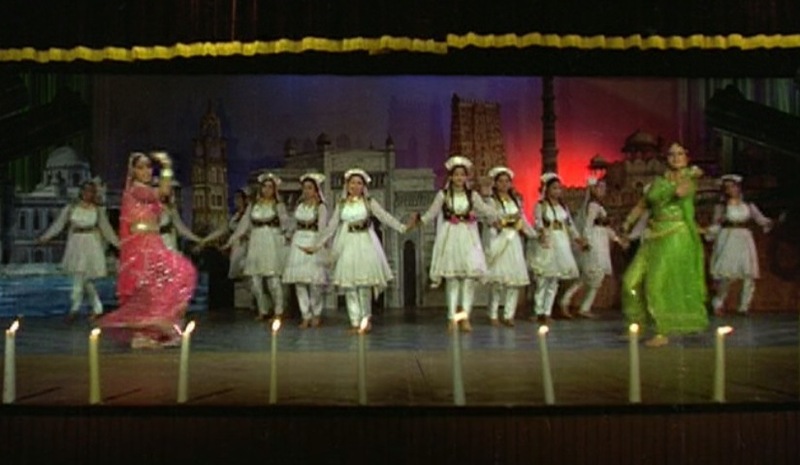 and one in which they dance with guns on a stage decorated with guns and famous buildings of India. The guns, in context, make perfect sense; the buildings do not, but I really like them and would gladly prop a few up in my yard. There are many details in this movie that should not be overlooked, such as the totally awesome submarine that the bad guys are in. C'mon, just go ahead and throw in the rubber duckie for fun, eh effects crew? 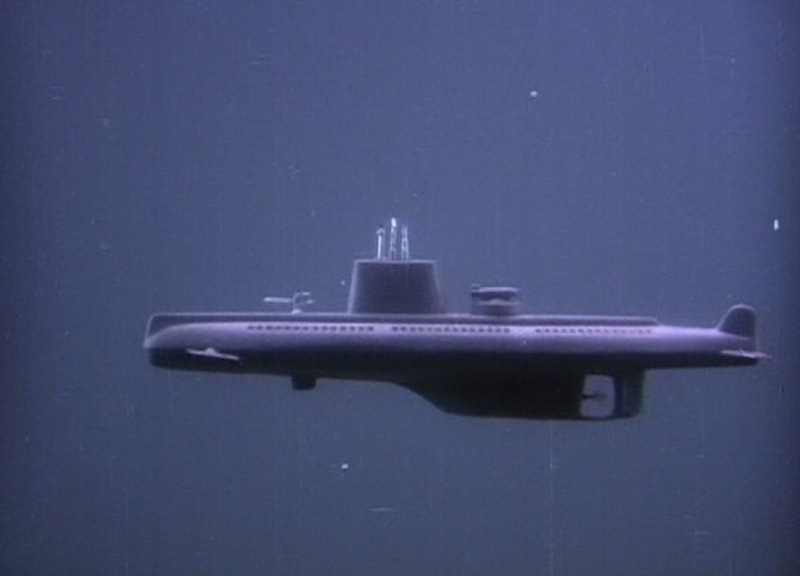 Towards the end of the film our heroes put on scuba suits and go after this thing, and the shot of their little vessel chugging along behind the submarine is very funny - the scale is completely wrong. 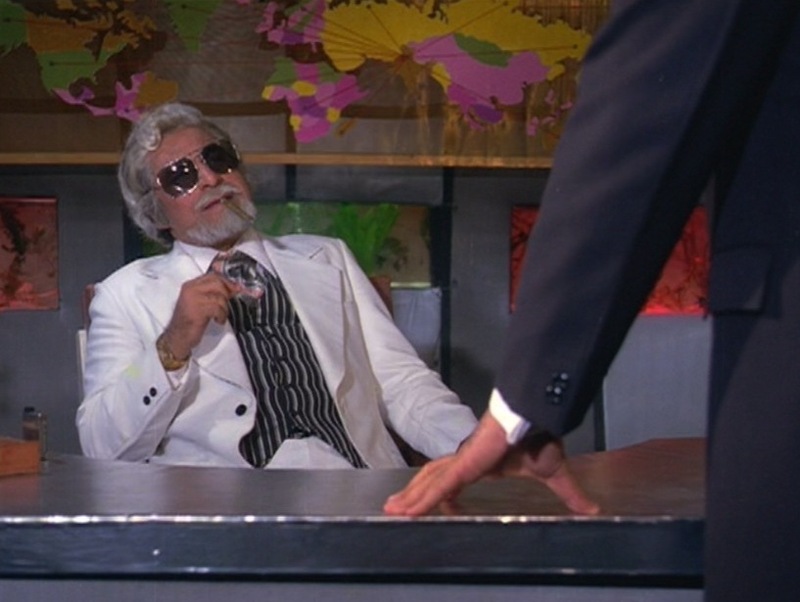 Kader Khan, who did the movie's dialogues, plays "Supremo," otherwise known as - wait for it - the head bad guy. Here he is in his submarine office, complete with the seldom-seen Condensed Southern Hemisphere/USSR Swallows Saudi Arabia Projection world map. 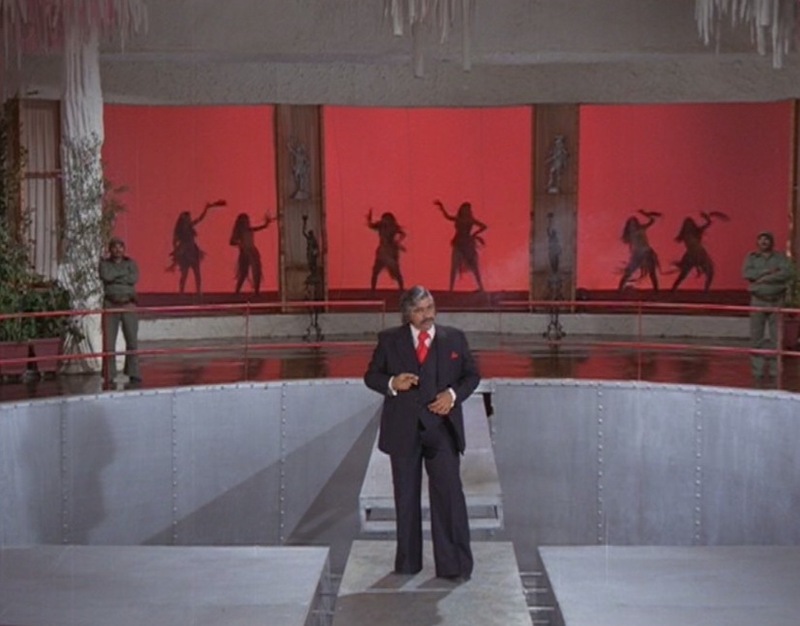 But oh my friends, la pièce de résistance: a villain lair that Bloefeld himself would be proud to call his summer home. It is comlpete with a Pit of Doom (I think it's supposed to be quicksand, but it's hard to say - it's not sharks with frickin' laser beams strapped to their heads, although lord knows it should be) with moving walkway/ramp and silhouetted dancing girls who dance, dance, dance no matter what chaos is happening elsewhere in the lair. This has turned into a seriously good Bollywood + James Bond weekened here at BLB, and I couldn't be more pleased - it's a fitting way to gear up for the release of Casino Royale in a few weeks, about which I am v eager. Anyway. 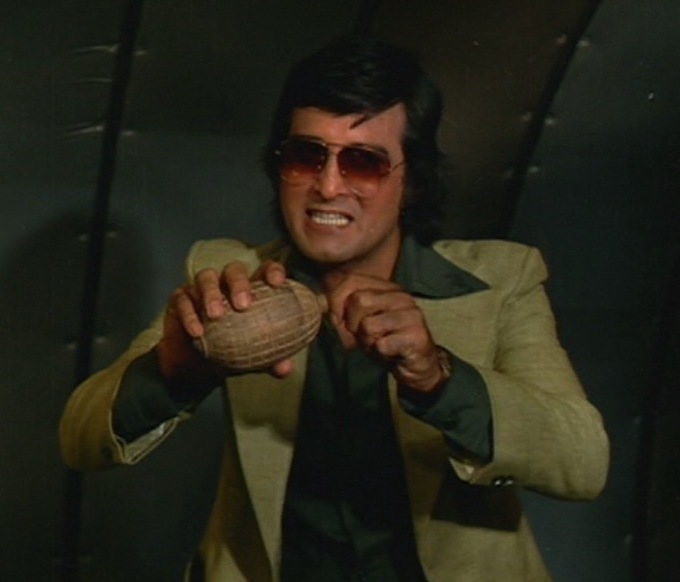 This is a really fun movie and features, in addition to the above selling points, an orphan, a school for the blind, Vinod Khanna driving a vintage white Mustang, Shabana Azmi dressed like Laverne/Shirley, and some arm wrestling. Who could ask for anything more? Amitabh is totally on board. * Have I gone too far with the riffing on the FPMBF joke? It's too far, isn't it? Sigh. Knowin' when to hold 'em never has been my strong suit. 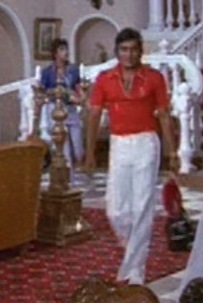 But trust me, in this scene, when he strolls in, totally owning the white pants, even though you can tell he knows he looks good, you have to lurve him. yeah I saw this movie recently too, it was really late at night and it seemed interesting. The channel you ask - Star Gold. PS. I'm with babasko, you just can't have too much FPM-anything, ever! How on earth did I miss this one??? Thank you so much. As a token of gratitude, I should send you a copy of Ankhen. It has one of those rooms where spikes pop out of walls that slowly close in on the hero. Where do you hire the contractors who built these places? Note these categories would eliminate us from having to evaluate Saif against Sharmila, which is only fair. Y'know, my mum used to work for IA way back when and I'm fairly certain she's met your FPMFIL *and* gotten his autograph... which she then proceeded to misplace. 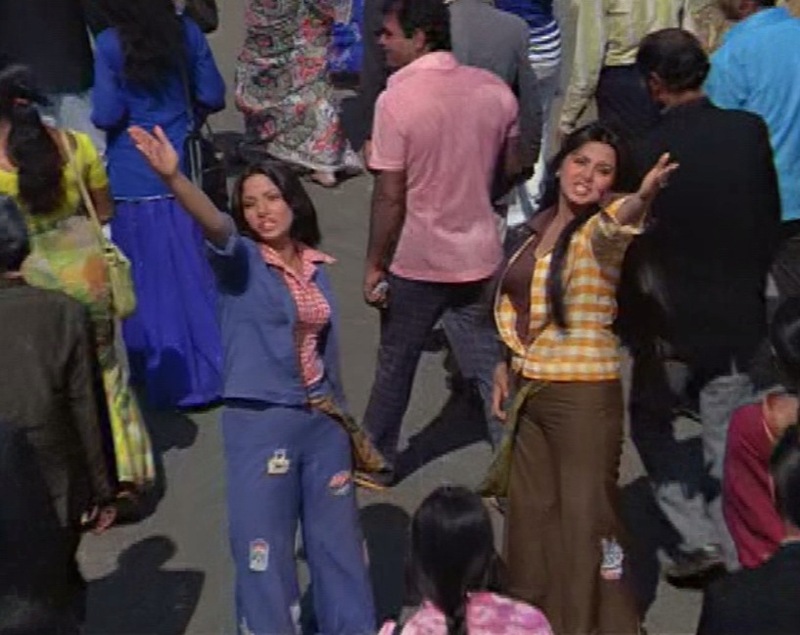 she's very non-Bollywood, kya karoon? Hi Beth: Thanks for recommending this. I saw it recently (notes here) and loved it! Cheers! well Beth, I finally tracked down a copy with subtitles. I own several other copies, including one where only Shammi rates a subtitle and we are left guessing at everyone else's dialogue. But the movie...where to begin? That fight in the hotel room where we know who they are but they don't but really they should have an inkling but anyway we know has possibly the hightest backflip and ninja jump to punch ratio I have seen in an age! Even better than the submarine and the mini-sub was the "swimming" - especially the gora lackey who had to try and defuse zee bombs. And the underwater fight scene. 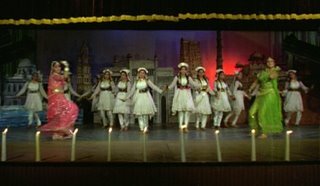 I am in total agreement re the flares and sassy attitudes of the heroines, and loved the sharp shooting qawwali. It's lucky that Shabana decided to be a serious actress because I don't feel dancing was her thing. And it was nice to see Master Tito - I wonder who he grew up to be. And I do approve of a good lair however, Mangal Singh did forget that rule about not having air ducts big enough to crawl through. Points off for that. Sigh. I love this movie so very very much. Temple, I think you can fashion a very nice set of matching coasters out of those DVDs, at least? 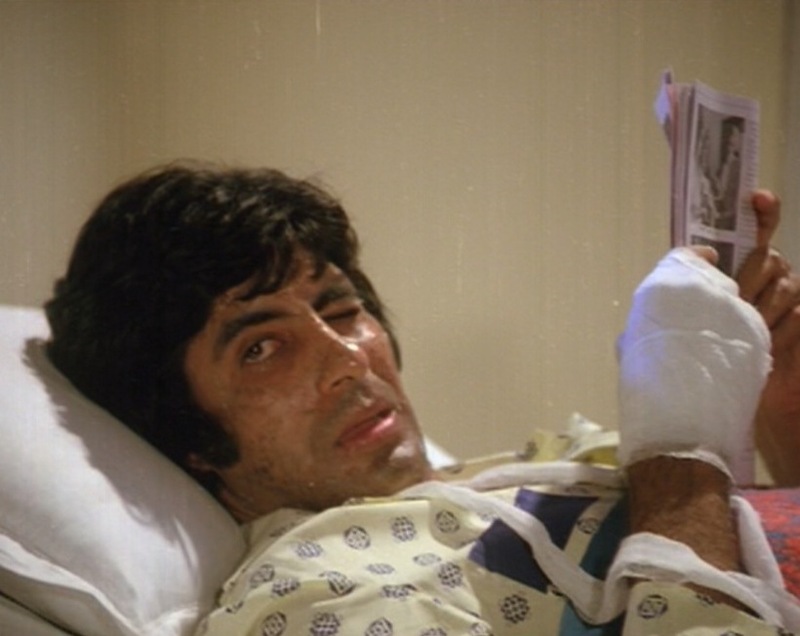 My non-working copy of Deewaar serves as such (but it does tend to stick to the bottom of very wet glasses, be warned) (oooh beverage warning of a different kind!). 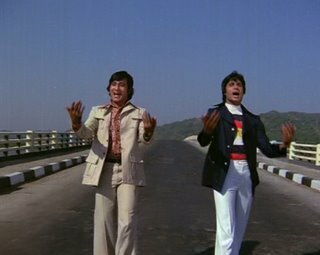 This movie has everything I could ever want from the 70s except Shashi, and frankly it is so very fine that I hardly miss him. That is good to know re: F(ake) P(retend) M(ovie) B(oy) F(riend). But that also means I have two in the 70s and I hope they can just agree to be competitors or work it out by one going under cover in the other's career path.... And Temple I do expect a list of your OWN FPMBFs sometime soon as I am not sure I know who they are!